Our Distillery 031 Spirit Aperitifs (37% ABV) are infused with a range of natural, local ingredients. This all natural spirit aperitif is hand crafted with ten times distilled 031 Vodka, infused with natural ingredients. The finest Madagascan vanilla beans are combined with African baobab fruit, which adds a subtle creaminess to the delicious spirit. 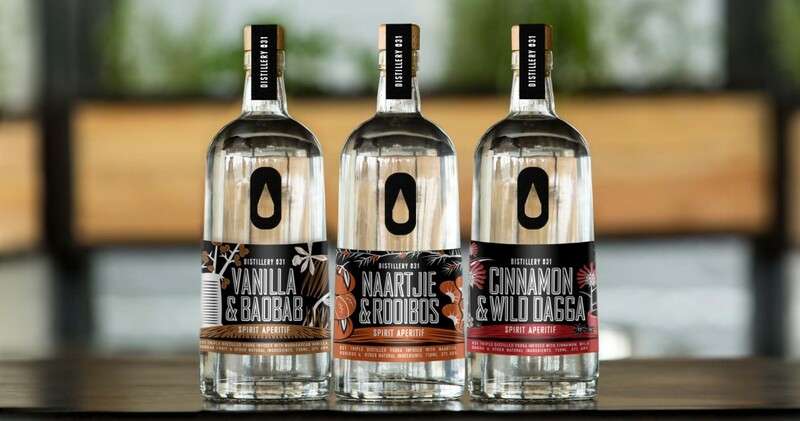 As local as ‘lekker’, this citrusy, all natural spirit aperitif is crafted with ten times distilled 031 Vodka and infused with natural ingredients. The finest South African grown naartjies are combined with organically grown rooibos from the Cape floral kingdom to give you a flavour that’s uniquely South African. We combine natural Zanzibari cinnamon bark with wild dagga which adds a subtle minty flavour to this all natural, spirit aperitif. Also known as lion’s tail, wild dagga is indigenous to Kwa Zulu Natal. This herb won’t get you arrested, because although it resembles the cannabis plant, it does not contain any THC.